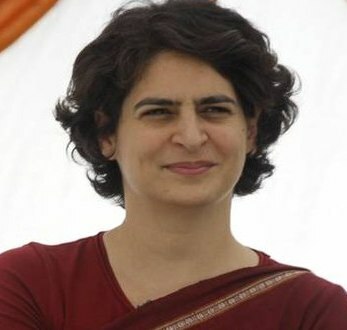 New Delhi, Apr 14 : Reacting to Bharatiya Janata Party (BJP) leader's comment on Congress President Sonia Gandhi's daughter Priyanka Gandhi, Congress Spokesperson Randeep Surjewala on Monday said that Priyanka was the bedrock of support for her mother and brother and that nobody could prevent her from enlarging her role in the spectrum of Indian politics. "She has always been bedrock of support both for her mother and brother, and has always defined her own political goal and will continue to do so. She by her own calling has chosen to work in the constituencies of Amethi and Rae Bareli. Not only has she done election management for her brother and mother, but also taken interest in the developmental activities for these two constituencies," said Surjewala. "She is a source of inspiration and encouragement for all congressmen. Nobody can prevent her and nobody will prevent her from enlarging her role in the spectrum of Indian politics. Priyanka Gandhi has chosen to restrict her role to constituencies of Amethi and Raebareli by her own choice. People across the country including all Congressmen love her. She will decide her own role. It is her choice to play the kind of role in the political spectrum that she wants to choose," he said. Earlier in the day, commenting on reports of Priyanka Gandhi's willingness to contest elections Swamy had alleged that Priyanka Gandhi was " an alcoholic" and had said that she had a bad name in the country. He had also said that Priyanka Gandhi would have been thrashed had she contested from Varanasi. Yesterday, Swamy had called Priyanka Gandhi an "ungrateful daughter" for going to see the prisoners in jail who assassinated her own father. He also said that it was Priyanka Gandhi and not Varun Gandhi who has gone astray and had added that the former and her party were not able to digest the latter's success.